Have the recent structural reforms implemented in Spain delivered? Can the country’s current economic condition be attributed to the effects of these reforms, or is it more the outcome of ‘automatic’ adjustments in the public and private sectors? By examining the stylised facts of Spain’s recovery, I seek to answer these questions and to contribute to the wider debate concerning the validity of existing economic models for predicting the impact of structural reforms. The goal is not to formally evaluate the impact of the reforms adopted in Spain since 2012, nor is it to establish claims of causality. More modestly, the goal is to examine the changes that have occurred in a set of economic indicators following the introduction of this set of reforms. The standard approach when evaluating the impact of structural reforms is to ‘translate’ them into shocks or parameter changes that can then be plugged into a model. Bouis and Duval (2011) is the classic reference in this regard. The European Commission (2016) – admittedly following a discussion of some of the method’s limitations – applies it when measuring the impact of actual reform measures in Italy, France, Spain, and Portugal. Similarly, the IMF (2016) examines the distinction between the short- and medium/long-term impacts of the two main reforms implemented in advanced economies — namely, labour and product market reforms. The literature typically understands structural reforms to be policy measures that increase competition, productivity, and labour force participation, while reducing unemployment, addressing market imperfections, and boosting all types of capital stock. Adhering to this definition, structural reforms are generally found to have a positive impact on GDP. In the case of Spain, the European Commission estimates that the main reforms included in its National Reform Programmes of 2013 and 2014 (as well as actually being adopted) could add around 0.2 percentage points a year to GDP growth. In the long run, this would mean additional increases in GDP of 1.3% by 2020 and 3.6% by 2035. As healthy as these estimates might appear, they are not as optimistic as those reported in an earlier Commission study (Varga and in‘t Veld 2014), which adopted a different methodology in its attempt to identify the potential gains of structural reform. In this instance, it was assumed that Spain could halve the gap on the best performing countries and so add 6 percentage points to GDP growth in ten years. However, as the IMF (2016) acknowledges, structural reform policies need to be held up to closer scrutiny. First, Eggertsson et al. (2014) argue that in setups like the present one with the nominal interest rate at its lower bound, “reforms do not support economic activity in the short run” and, in the absence of an appropriate monetary policy, they “fuel expectations of prolonged deflation, increase the real interest rate and depress aggregate demand”. Second, Rodrik (2015) warns that, although the theory underpinning structural reforms looks simple (that is, opening up an economy to competition increases efficiency), real progress (i.e. moving from potential to actual GDP gains) usually requires targeting an economy’s specific ‘binding constraints’ rather than adopting incremental reforms. Given the wave of reforms introduced, Spain should be well on the road to recovery by now. Yet, this is not fully borne out if we consider the following stylised facts (Xifré 2016). The falling trend in the Spanish current account balance was stemmed in 2009, before any significant structural reforms had yet been adopted. The same is true of most of the country’s price/cost competitiveness indicators (real exchange rates adjusted in a variety of ways). A case can be made for the fact that Spain’s subsequent recovery has been supported by domestic reforms and by the ECB’s change in monetary policy; yet, what remains beyond doubt is that the initial shift in trends was not a response to any policy action (Figures 1 and 2). The Spanish economy has certainly corrected some of its more acute imbalances, both external and internal. The financial sector is quite clearly in better shape now than before the crisis and public debt has abandoned the disastrous trajectory it initiated in 2009. The construction and real estate sectors have been significantly downsized and much of the loss in value added is being offset by exports. However, net exports of non-energy products represented just 0.5% of Spanish GDP in 2014. This figure has risen in recent years but it is still much lower than the corresponding figures for Germany and the Netherlands (both above 10% of GDP) and even that of Italy (5.3%). These gaps are a measure of the challenges Spanish firms face as they seek to internationalise. The size of the challenge is further highlighted if we break GDP growth down between domestic and external demand — as soon as domestic conditions improve, virtually all GDP growth is attributable to the growth in domestic demand. It is in the labour market where reforms have been most actively and controversially implemented. Employment and unemployment in 2015 appear to be quite different conditions from what they were in 2008. Long-term unemployment has increased by a factor of four during the period, reaching 44% of total unemployment (Figure 3), while the percentage of the unemployed at risk of poverty or social exclusion has risen from 40 to 60% in the period. There has been net job creation in the three years following the 2012 reform, but for every two new temporary contracts created, one existing permanent contract is lost (Table 1, shaded column). The percentage of employed workers at risk of poverty or social exclusion, which remained stable between 2008 and 2013, has also increased in the last couple of years. There is evidence that the boundaries of firms and the organisation of labour in the Spanish economy have been redefined. 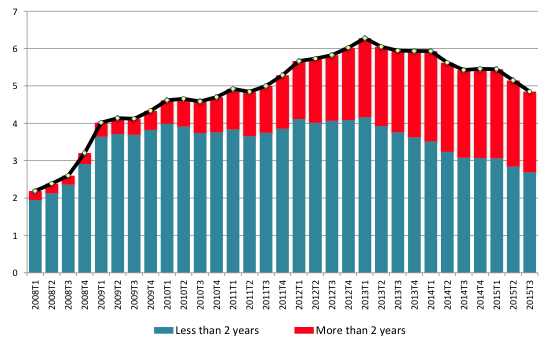 In 2015, for the first time since the crisis, net creation of business (including sole traders and all other company types) was recorded. However, it is the first time in recent records that the type of business contributing most to net growth is sole proprietorship. The number of joint-stock companies continues on a steady decline, while that of limited liability companies increases very slowly. It is too early to consider this the beginning of a trend, but it may well reflect a change in strategy, with some firms opting for smaller structures and an increasing reliance on outsourcing. The number of companies performing innovation activities in 2014 is roughly half that in 2008 (43% in the case of technological and 60% in the case of non-technological innovation). This adds to the worrying behaviour presented by R&D spending, down four years in a row in the public sector and six years in a row in the private sector. Spain is once again ‘different’ — the convergence of Spain towards EU and the Eurozone in terms of R&D intensity ceased in 2009. Spain’s economy is recovering and some of the reforms implemented have contributed to this; yet, there are clear signs of the limitations of the reform agenda adopted to date. Indeed, initial improvements in competitiveness started ‘automatically’, before any major reform measures had been taken. Furthermore, there are no real signs that critical elements of the Spanish economy have changed significantly as a result of policy — as in pre-crisis Spain, GDP growth is basically sustained by domestic demand, net export levels are still well below what they should be, and the labour market looks, if anything, even more dual and precarious. Finally, there are a number of new trends that are giving cause for concern, not least the sustained reduction in the number of companies undertaking innovation. The causes of many of these problems run deep and a number of recent studies have examined how to remove the structural bottlenecks or ‘binding constraints’ (Rodrik 2015) that have come to typify the Spanish economy (see Andrés and Doménech 2015). More generally, the Spanish experience suggests that the models we use for estimating the impact of reforms, and for judging policies, need to be carefully checked against reality. Andrés, J and J Doménech (2015) En busca de la prosperidad, Ed, Deusto. Bouis, R and R Duval (2011) “Raising potential growth after the crisis: A quantitative assessment of the potential gains from various structural reforms in the OECD area and beyond”, OECD Economics Department Working Paper 835. 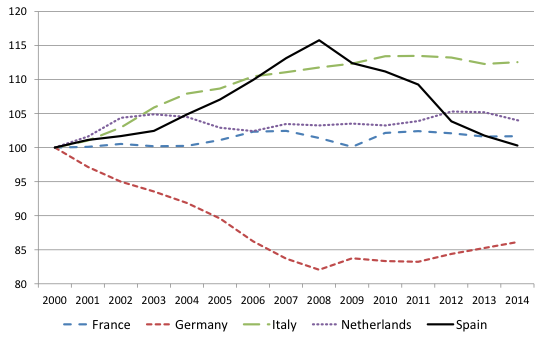 European Commission (2016) “The economic impact of selected structural reform measures in Italy, France, Spain and Portugal”, Institutional Paper 023. 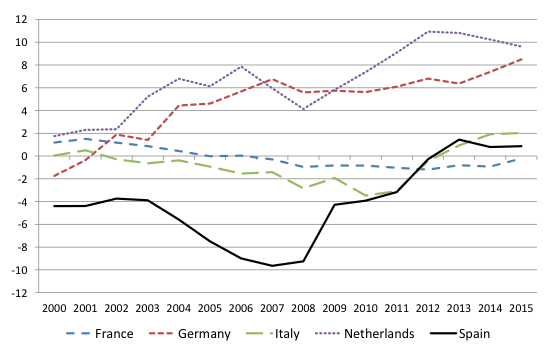 Eggertsson, G, A Ferrero, A Raffo (2014) “Can structural reforms help Europe?” Journal of Monetary Economics, 61: 2-22. IMF (2016) World Economic Outlook, April 2016: Too Slow for Too Long. Rodrik, D (2015) “The mirage of structural reform”, Project Syndicate. Varga, J, and J in 't Veld (2014) “The potential growth impact of structural reforms in the EU: A benchmarking exercise”, European Economy Economic Papers no 541. Xifré, R (2016) “Spain in the wake of the crisis: Reforms or adjustment?” IESE Working Paper 1141-E.